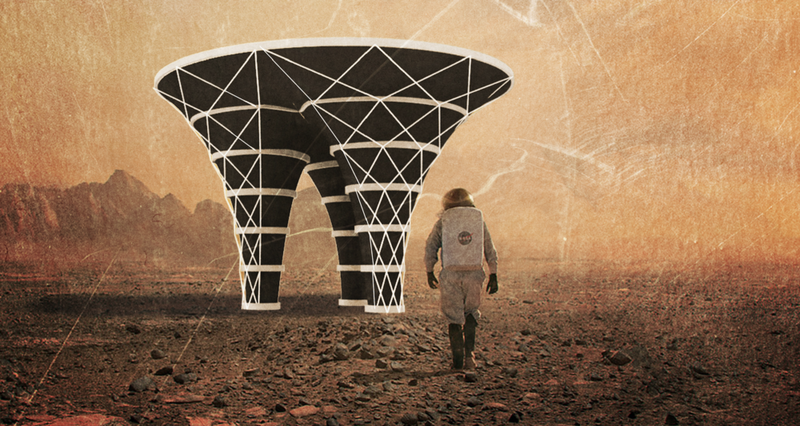 Interview by Christopher Ball and Adam Kor While most architects seek out earthly sites, Christina Ciardullo looks to the stars and imagines what building on Mars might look like. Bringing humanism to the scientific world of NASA, Ciardullo's work and teaching explores how the unforgiving climes of Mars might support not just people, but poetics. Christopher Ball: Having worked in your research on Martian architecture as both an architect and an educator on interdisciplinary teams—often composed largely of scientists—what are some of the opportunities and challenges that you’ve found? Adam Kor: Did you encounter these issues when working on your design proposal, the Ice House, for NASA’s 3D-Printed Habitat Challenge for Mars? CB: How have these issues manifest themselves in your work as an educator? For example, with regards to your Mars Studio, what are some of the differences between working as a part an interdisciplinary team and teaching an interdisciplinary class? CB: As an educator, what attitude do you bring to your teaching? As you mentioned, much of teaching is an open experiment of sorts, so how do you encourage your students to have personal agency in what they’re doing? And more generally, how do you work with and teach students who might have different interests than your own? AK: You recently presented your work on Martian architecture at the conference, “Closed Worlds: Encounters That Never Happened,” organized by the Storefront for Art and Architecture and the Cooper Union. Touching upon what you presented there, how do you think this research on closed systems and building in extreme environments is relevant to and can inform more traditional modes of practice? CB: The conference was also interesting because it talked about the parallels in architectural history. The concept of an “architectural closed system” has a long history but it doesn’t really have any built precedents. How does that history inform your work? Do you look back to those experiments in the ‘60s as inspiration when designing for outer space? CB: The precedents of that era make me think of the architecture of bubbles: Haus-Rucker-Co, Ant Farm, and Buckminster Fuller. As you mentioned, architecture in space needs to be self-sustaining and extremely predictable because you really can’t leave things open to chance. At the same time however, from a humanist perspective, that’s extremely limiting to personal freedom and agency. How do you design for chance in a system where there really isn’t any degree of tolerance? CB: Living on Mars or in space, architecture literally becomes your entire environment and the only thing you experience. In this case, what is the limit between architecture and the human experience? CB: With regards to the idea that maintaining human psychology is just as important to life as the physical support system, how do you begin to design for that? CB: We’ve talked about questions of the self, the unknown and the meaning of life—it’s all very existential. With a BA in Philosophy and Astronomy, how has that background informed your interests and work in architecture? CB: After having worked as a designer for Ennead Architects, you then quit your job to pursue ventures in Martian architecture, first consulting with Foster + Partners before starting your own group, SEArch. Having made bold career moves as a young woman in architecture, what advice would you give for those just starting out? AK: After all, your interest in architecture and space is all about the unknown! A version of this article appears in inter•view, vol. 2 of inter•punct, a journal for architecture founded by students at Carnegie Mellon University. Christopher Ball, Chief Editor of interpunct vol. 2, is an architect, editor, and designer currently working at Buro Ole Scheeren in Beijing. Adam Kor is a Contributing Editor for Interpunct vol. 2, and third-year architecture student at Carnegie Mellon University.